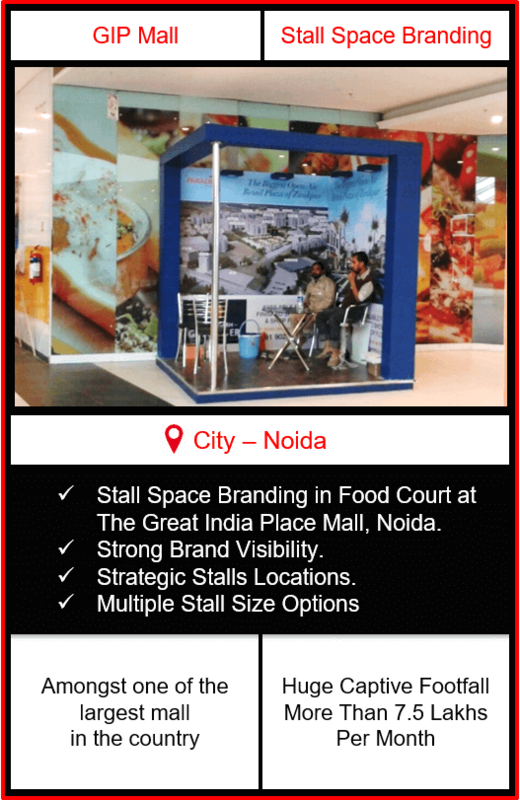 Select Size of Stall	 Please select... 4 ft. x 4 ft. 6 ft. x 6 ft. 8 ft. x 8 ft.
Advertising in Mall – The Great India Place Mall, Noida is one of the finest way to grab attention of massive captive audience and engross them towards your brand’s advertisement. The Great India Place Mall, popularly known as GIP Mall or TGIP Mall is one of the largest and the most visited mall in the country. 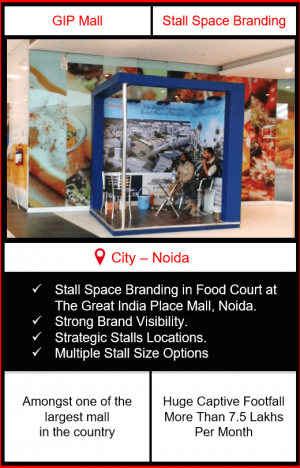 Advertising in GIP Mall, Noida offers an enchanting way to deliver your targeted audience with a 360-degree overview about your brand through unique branding options in the food court. 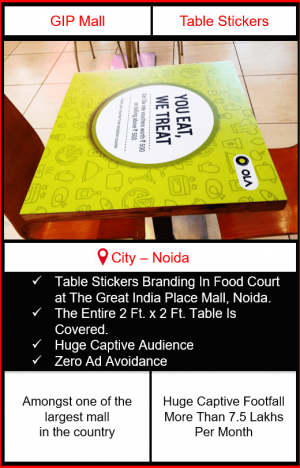 With assortment of advertising options in Food Court, The Great India Place Mall, Noida ensures your brand’s ad Have Zero Ad Avoidance. Exclusive Branding options in Food Court, lets your brand to boost up its engagement rate and induces the Brand Recallment which in turn offers you a Grand ROI. 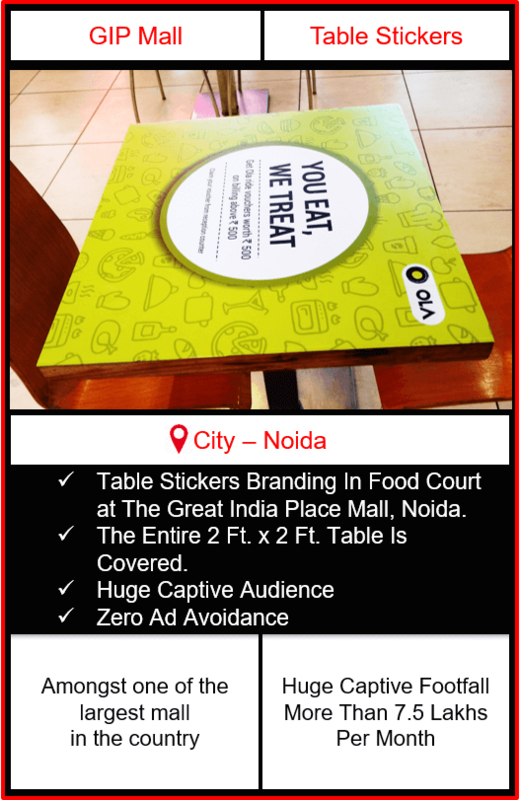 1.Table Stickers Branding: Table Stickers Branding in Food Court of The Great India Place Mall endows you with your brand’s TG (Target Group). With high dwell time of minimum 1 hour, people spend their leisure time in food courts. Thus, offering you quality captive audience as well as providing your brand’s advertisement strategic location to get noticed. 2.Stall Space Branding: The prominent way to create a one-to-one contact with your targeted audience is to advertise your brand through Stall Space Branding in the GIP Mall, Food Court. This branding medium not only boost up your brand’s interaction power but it also ensures to strengthen your Brand Equity. 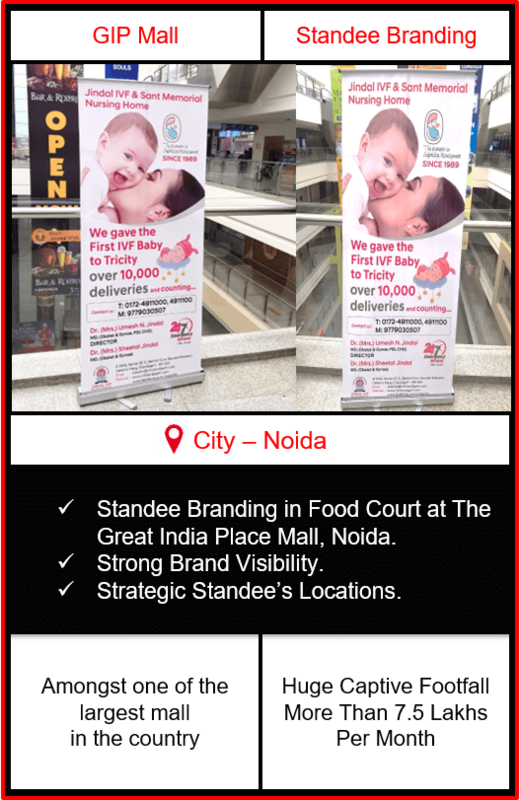 3.Standee Branding: Advertising in the largest mall and still remaining budget efficient is now possible with Standee Branding in The Great India Place Mall, Noida. Standee Branding in food court of GIP Mall offers you to stand out of all the old branding options, it provides your brand to grab peoples’ attention at first sight. Advertising in The Great India Place Mall (GIP Mall), Noida Food Court helps your brand to get exposure to the premium captive audience which not only includes your TG (Target Group) but also helps your brand to have its range of vision on the people of different demographic area. As GIP Mall is visited by people of different backgrounds coming from different regions. It Offers your brand get Negligible Ad Avoidance with Huge Brand Recall and Strong Return on Investment.